Sheet: These have some of the best sheets because they are those thin ones that look almost clear on the face. It also fits me rather well in terms of where the cutouts are, though it extends into my hairline, which is a good thing for you, since I have a petite face and this means it's not too small. Only the part above the lips is just way too thin. Essence: This one has a classic serum like essence, which isn't sticky or heavy. The moisturising grapefruit version has a different, very comfy lotion like essence, while this one is lighter and doesn't have that soothing feeling. Scent: It's got a gentle lemon fragrance and it that good, non-cleaning products way. Effect: This wasn't my favourite brightening mask, as it didn't do much compared to some others like Papa Recipe or My Beauty Diary Black Pearl. My skin also felt a bit tight, so it's not that moisturising and I think it'd be best suited for oily skin, while for me I much prefer the Grapefruit version. Worth it? I won't buy it again. Snail secretion actually break me out, but since I enjoyed the V Prove mask so much, I wanted to give them another chance. Snail mucin is a powerful hydrating ingredient and it also promotes healing. I already had the Hyaluronic Acid and Collagen versions, neither really impressed me with their results, but I liked the thin sheet. Sheet: thin, very comfortable and the fit is regular. It's about the same as The Saem's and The Face Shop The Solution ones. Essence: Super comfortable milky lotion and not at all slimy like Naruko's. I just loved it and it's equally comfortable as The Saem's Grapfruit. Scent: creamy chemical and not strong. Effect: Immediate effect was some redness on my forehead, but no sensation of irritation or burning. Like I said before normally snail stuff break me out, but I used this during a breakout and it reduced it 90%, plus everything started to heal a lot faster (it was gone is the next couple of days). And it was one of those chin volcanoes that I accidentally picked, which usually turns in to a two week nightmare. It also made my skin smoother, so I was very impressed by this formula. 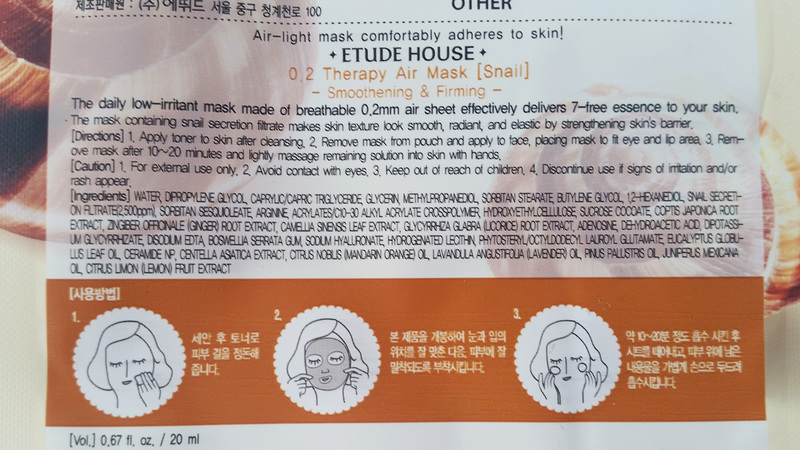 Madecassoside by The Face Shop has a very similar result if you're freaked out about the snails. Worth it? Yes. I bought a pack of these. Reviews on this entire line are mixed, including their scents. Mine as a smoothing version and there are several others: milk, coconut, strawberry, coffee and green tea. Sheet: it felt like a regular sheet from the start, and an average fitting one (slightly too large for me), but it started feeling a bit thick and it came off in some places, like above my lip. The sheet just wasn't my favourite. Essence: a comfortable milky lotion. Scent: strong creamy vanilla floral scent. I found it very pleasant, but it's not like chocolate at all if you're expecting that. Effect: This was a really good moisturising and nourishing mask, so my skin liked it a lot. I used it when my skin was flaky dry and I haven't had a flake since. Worth it? The sheet is not the best, but I liked the effect of this one as well as the lovely scent. Overall it's worth the purchase. Ginseng is one of the most valued ingredients in K-Beauty and has some anti-ageing properties, so I took two of the cheapest masks with ginseng that were on Cosmetic Love. I like The Solution Masks from The Face Shop, but this was the first time trying these Real Nature ones. Sheet: it feels like a regular mask, but it claims to be some special air pocket pulp sheet. It's quite a large mask, which fit ok around my mouth and eyes, but it extended into my hairline. Essence: The essence has a yellow brown tint which makes the whole sheet in that colour. It's a like a light serum/lotion and in smaller amounts in sinks in fast, there is also not much stickiness from this. 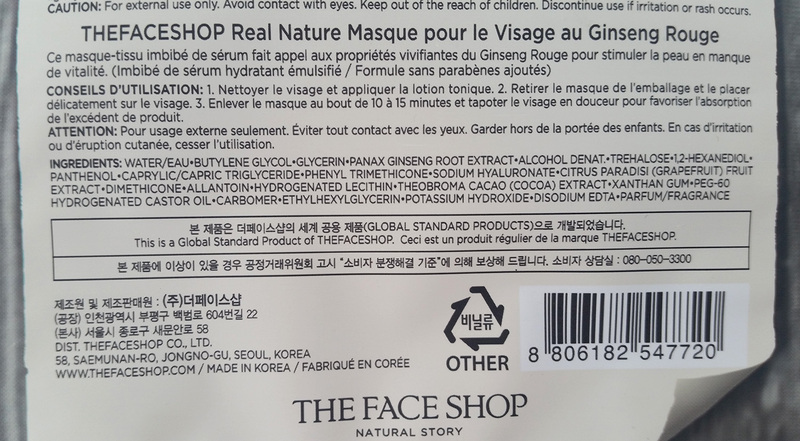 Ginseng is on the 4th place among the ingredients. Scent: given that it's a ginseng product you can expect a typical ginseng scent. It's quite strong. Effect: this promises to add energy and boots vitality which to me isn't really a visible type of thing, but it was a nice mask that moisturised the skin and made it feel good. This might have a good effect if you use it regularly. From Tony Moly masks I only had the Pokemon Pikachu version with honey which was lovely. 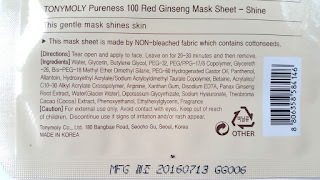 These are 100% cotton sheet masks and exist in several versions, I only took ginseng and as soon as I saw ingredients I was disappointed because this looks like stuff made here - glycerine on the second place (not bad) followed by PEGs and nothing of value until the 8th place (panthenol), while ginseng is very low on the list (16th). Sheet: Classic with an ok fit. It was too large for my face, but that makes it normal. Essence: a light, toner-like essence. Based on the ingredients, like an inexpensive toner. Scent: No ginseng scent in this, just a boring shampoo fragrance and a strong one. Effect: The layer this left had a very glossy look to it, but overall it's just a basic moisturising mask. Worth it? No, even though it's cheap. I bought Pearl before and it impressed me so much, I wanted to try all of these. It's the only range of sheet masks so far that fits my face perfectly, so even as far as comfort goes it's a winner for me (also the sheets are ultra-thin only 0.21 mm thick). After trying all other them I still love Pearl most and I found some nice new favourites, especially the Madecassoside is lovely, but there are also some that I felt were a waste of my time. Each version has a specific ingredient singled out, but in general they form groups of moisturising/hydrating/nourishing, anti-age, brightening and for oily skin. Sheet: thin 0.21mm ones that are almost invisible when saturated with product. 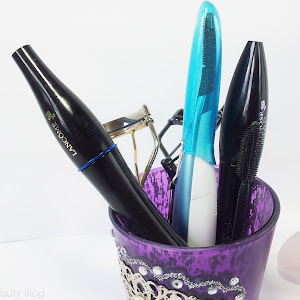 These fit my petite face almost perfectly and they are very comfortable on the face. For brightening. Contains pearl extracts and niacinamide. Essence: A serum-gel type of thick essence that needs time to absorb and feels nice on the skin. Scent: is nothing special, though it is noticeable. It's just a sweet chemical scent. Effect: This is the same mask as the Snow White version I raved about a year ago and this is already a repurchased mask, as I reviewed this Solution mask before. It leaves my skin was incredibly soft and smooth, hydrated, more even and just in general in great condition. Foundation applies like a dream after using this mask. This is the formula that made me fall in love with K-Beauty. For radiance. Contains vitamin C and niacinamide. Essence: very sticky and thick, more like a lotion than a toner, so overall a rich texture. Effect: As you might expect for a vitamin C mask, it was brightening and it evened out the skin tone, though not dramatically like Pearl and it was more temporary too. It was also nicely nourishing.The essence became incredibly sticky once it dried, so some might dislike it and need to wash it off. Worth it? If you don't mind the stickiness, yes. Anti-wrinkle and nourishing effect. Aside from propolis also contains adenosine. Essence: milky and leaves a sticky layer, but not like Vitamin C.
Effect: It left my skin moisturised and more plump, meaning that the lines looked a bit smaller, though not dramatically. I liked this one. Firming and anti-wrinkle effect. Aside from collagen contains adenosine. Essence: milky lotion that leaves a smooth feeling if it's applied in thin coat, while in a thick coat it's quite sticky. Scent: same fruity/sweet chemical one as in most. Effect: This one was a weird one. I saw immediate plumping effect and improved elasticity, wrinkles were temporarily slightly more filled out, however in the morning all the elasticity was gone, in fact it was worse than without because my crease on the side I sleep on, just didn't want to disappear. Scent: slightly deeper scent that others. Essence: a simple clear lotion. Effect: This one was nothing special, it was the most boring and pretty much useless in the bunch. It had a classic moisturising effect and no effect on wrinkles. Scent: a bit fresher than others. Essence: A thick toner / light serum one. 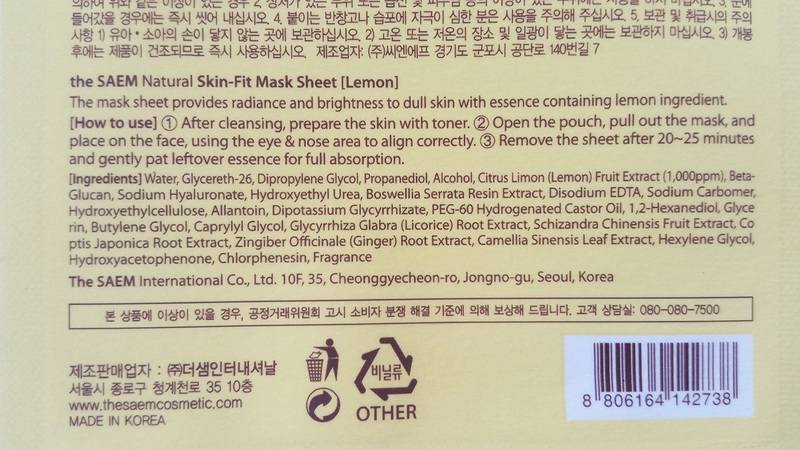 Effect: Just as I expected it's a very basic hydrating sheet mask. Hyaluronic acid does its job and that's it. Boring and basic, but good if your skin is dehydrated. Moisturising effect. Ceramides help replenish the skin moisture barrier. Scent: more creamy than others. Effect: This one was like I used the best moisturiser ever. My skin just felt and looked so good. I liked it a lot. A soothing effect and suitable for sensitive skin. Madecassoside is derived from centella asiatica and it's been linked to healing and anti-ageing properties, more specifically to collagen production. Essence: clear lotion that like at most of these feels a bit sticky when the mask it taken off. Effect: I loved this one. It's definitely great for healing and toning down inflammation. It's also nicely nourishing and my skin looked great in the morning after using this one. I would repurchase it. For oily skin, reduces shine and the appearance of visible pores. Contains tannins, a naturally occurring polyphenol. Effect: I used this during a breakout to maybe calm it down a bit and it worked a bit, but not amazingly like EH Air Therapy Snail one or Madecassoside. I didn't notice my skin being more matte, like at My Scheming ones nor did it work on my pores, but my skin was nicely moisturised. It's ok, but I wouldn't buy it again. For blemish-prone skin. Contains black willow bark extract and salicylic acid. Scent: more medicinal than others. Effect: I used this on unclear skin. It didn't have any immediate effect and I didn't feel that it's doing much for clearing the skin. However, unlike most such masks which are best for oily skin I've tried, it was nourishing and there was no tight feeling. Sheet masks I loved the most: Etude House Air Therapy Snail, A'Pieu One Milk Pack Chocolate, The Face Shop The Solution Pearl, Vitamin C, Propolis, Madecassoside and Ceramide. Love sheet masks! Ooh I would love to try those ginseng masks! Etude House Snail verzijo sem si že dodala na wishlisto po tvoji zaslugi. NJihove sheet maske so mi všeč, zato bom naslednjič zagotovo sprobala še to verzijo. Od ostalih se mi pa najbolj zanimivo bere The Face Shop Madecassoside, ki bi verjetno prišla še kako prav pozimi, ko imam bolj občutljivo kožo. Pa tudi ceramidi so mi zelo všeč od Etude House, tako da bi od TFS tudi preizkusila. Ok pa Pearl itak :). Odlična objava, kot vedno. <3 Tvoja K-beauty priporočila so vedno super, sploh ker dokaj malo tega najdeš na blogih. Bolj moraš iskat po forumih. EH Snail pa The Saem Grapefruit sta meni comfort heaven :) Bi od EH še Ceramide preizkusila, ko jo že itak hvališ. Madecassoside me je zelo pozitivno presenetila. Nisem vedela kaj naj pričakujem od nje razen, da bo vlažilna/hranilna, ampak zraven res dobro pozdravi kožo. Te moram tudi naročit plus pearl. I love 'em all! I'll look for them online so I can get at least one of each. Thanks!